Do I Need an Oral Surgeon for My Molar Tooth Extraction in Marietta? 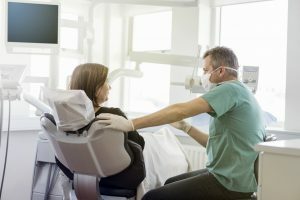 If your dentist recently told you that you need to have a molar extracted, you might be a bit surprised that you were referred to an oral surgeon. Often, general dentists will handle the extraction of teeth, like the incisors, but not the molars because the process is more complex. Instead, an oral surgeon is needed to handle the procedure. At Muskingum Valley Oral Surgery, Dr. Jeff Lee will provide the molar tooth extraction in Marietta you need to restore your oral health. Although the teeth are designed to last a lifetime, there can come a time when you need to have a molar removed, such as due to decay or injury. In some cases, you may need your wisdom teeth removed due to impaction, overcrowding, or infection. If the tooth is left in place, it could negatively impact your oral and overall health. Although impaction and decay are the leading causes for the removal of a molar, there are other reasons your dentist may have recommended an extraction. If you suffer from significant overcrowding, infection that has spread into the gum line, or a significantly broken tooth that is not visible above the gum line, it is best to see an oral surgeon. Due to the complexity of the procedure needed to remove a molar, it is best to have an oral surgeon, like Dr. Lee extract the tooth. The molars are different that the other teeth in the mouth. Since the teeth are larger compared to the others, they often have more than one root, which can also be curved. This makes the removal process more difficult because the tooth often has to be broken into smaller pieces, which are then removed one piece at a time. To further complicate matters, a molar can become impacted, which often occurs with the wisdom teeth. When a tooth is impacted, it is trapped underneath gum or bone tissues. As a result, a simple extraction cannot be used. A surgical extraction is necessary, which involves opening the gum tissue and removing the surrounding gum and bone to extract the tooth. After evaluating the tooth, Dr. Lee will develop a treatment plan, which will involve either a simple or surgical extraction. A simple extraction is used when a tooth is fully visible above the gum line. A surgical extraction will be needed when a tooth cannot be seen above the gum line, such as an impacted tooth or one that has suffered a significant break. Where Can I Have My Molar Removed? If you have a molar that needs to be removed, choose a trusted and experienced oral surgeon. Dr. Lee is specially trained to handle even the most complex extraction procedures safely and effectively. Contact Muskingum Valley Oral Surgery today to schedule your consultation for the removal of your molar. Comments Off on Do I Need an Oral Surgeon for My Molar Tooth Extraction in Marietta?